Physical activity is an important part of everyone’s life and well-being. Based on Centers for Disease Control and Prevention (CDC) recommendations, children under 18 should have a minimum of 60 minutes of physical activity every day. Adults should have 30 minutes of physical activity five days a week. Recent studies have revealed, however, people are choosing television or an electronic device instead of going out and exercising. 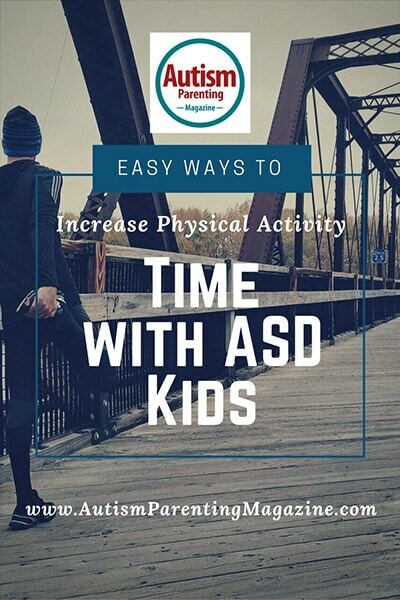 Unfortunately, it can be difficult sometimes for individuals with autism spectrum disorder (ASD) to participate in physical activity. How can we improve these statistics? With the diagnosis of autism spectrum disorder (ASD) comes various social and cognitive barriers. Many individuals with autism have difficulty in social situations. They can have difficulty communicating their needs or understanding other people’s expressions. A trip to the gym, participating in team sports, or even a walk in the park can be an overwhelming task. They may also have difficulty processing instruction or understanding abstract concepts. The act of running in place on a treadmill or participating in a group exercise class can easily overload the senses. So how can we help remove these barriers? What can we do to alleviate some of these obstacles? The first step to facilitating a new activity is familiarity. We all have an easier time with new things in our lives when we know what to expect. For example, imagine being in school and your teacher comes in and tells everyone that there is a test in five minutes and that you are the only one taking it. You don’t know what the test covers, how long it is, and why you are the only one taking it. Would you be nervous or anxious or worried? Would you be able to concentrate in studying for those five minutes before the test, not knowing what you are supposed to be studying? Well, most individuals on the spectrum have to face this same scenario with almost every new activity in their lives. Now compare your thought process and emotions if you knew exactly what topics your test was going to cover, and you spent a significant amount of time studying days before and you felt prepared. Would you feel less nervous or anxious or worried? Probably. So, let’s follow this same concept when introducing a new physical activity to our individuals on the spectrum. If you are planning a simple walk around the neighborhood or a visit to the park or local YMCA, plan ahead. Drive around the neighborhood days before you plan on walking it and explain how you would like to walk that same route. Drive to the park and scope out the playground, talk about the kids playing there, and maybe even do a quick walk through the park. Point out all the great stuff you all would be able to do when you visit in a few days. Visit your local YMCA and meet some of the staff. Take a tour of the facility and point out the different equipment you can use. These actions help them understand what to expect when it’s time to do them. Make sure you include exact dates in which you plan to participate in these activities. Make a plan for how long you will be there and who will be going with you. The second step to facilitating a new activity is practice. Doing a practice run to the park or the YMCA helps individuals on the spectrum get comfortable with the idea of doing something new. Your practice run may be limited to driving into the parking lot and looking out the window or go as far as actually taking a tour of the facility or a quick walk through the playground. What we are looking for is positive responses from our individual. It helps if we add positive comments while doing a practice run. For example, while taking a tour of the YMCA, point out all the fun and great things they have for kids to participate in. If at the park, take the time to sit on a swing yourself and demonstrate how much fun it can be. The first few visits to your new activity should be filled with positive experiences and comments. Conversations can go a long way. When possible, talk about your upcoming outing and come up with a plan together. If your visit is to the YMCA, talk about what you are doing first and second. Discuss the things you see and how excited you are to do them. What are you planning to wear? Conversation can create excitement with the right comments and approach. Aside from creating excitement, these conversations can also help develop a plan and structure to your visit. Structure can help indicate a beginning and an end to your visit which can help alleviate some anxieties. All individuals on the spectrum respond differently to these strategies. Be prepared to repeat each step more than once when needed. Take your time introducing a new event or activity for increased success. Stay positive and supportive throughout this process. It takes time to implement new rituals and events in someone’s daily routine, but these are well worth the time. Alfred Chavira is the director of health and wellness programs at Any Baby Can San Antonio. Over the past 10 years, Alfred has been part of the Adapted Fitness world with the goal of increasing physical activity levels in individuals on the spectrum.